The Pre-Kindergarten (K3) contains the main academic areas of Bible, Reading Readiness, Language Concepts, Numbers, and Special Activities (including manners, music appreciation, art, health and safety, literature, exercise, and others). While not designed specifically to teach reading, important introductory concepts and skills are taught so that the students who complete this program will be thoroughly prepared to learn to read the following year. LFBC is proud to present this first-class, academically sound, easy-to-use Kindergarten program, written and published by fundamental Baptists through the ministry of a fundamental Baptist church. Much prayer, diligent effort, experience, and sacrifice have gone into the production of this program, and it is our prayer that it will be a blessing to many, serving as a firm foundation for a lifelong pursuit of learning. 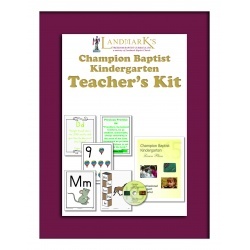 The main academic areas in the Champion Baptist Kindergarten are Phonics/Reading/Writing, Numbers, Bible, and Daily Topics (such as safety, health, science, history, and fine arts). The program is designed as a complete phonics-based reading and writing program with a strong arithmetic emphasis. In addition, the unique Beginner's Champion Phonics Reader teaches students how to develop speed in their phonics reading, while the McGuffey's Eclectic Primer provides the setting for developing comprehension at this young age. 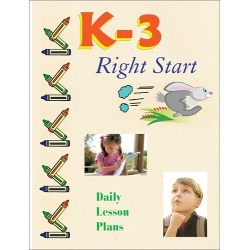 The Teacher's Kit can be reused from year to year. 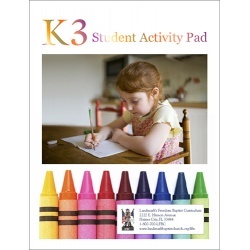 It is designed to be used with the K3 Student Kit. All work sheets, one kit per student required. The Teacher's Kit can be reused from year to year. 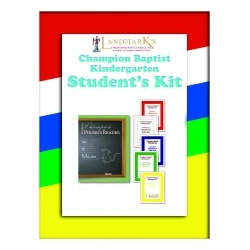 It is designed to be used with K5 Champion Baptist Kindergarten Student Kit. Comes with Daily Lesson Plans Manual, The Beginner's Champion Phonics Reader, McGuffey's Eclectic Primer, "Teaching Phonics Sounds" CD, 31 Alphabet Flashcards, 20 Numbers Flashcards, 36 Bible Memory Verse Cards, 7 Phonics Charts, 19 Phonogram Towers, and 1-10 and 1-100 Numbers Charts. Consumable material includes over 700 pages of worksheets. These consist of 36 weeks of Letters and Numbers Pads, Letters and Numbers practice writing tablets, Memory Verse Charts, and small numbers cards. The kit also comes with The Beginner's Champion Phonics Reader, McGuffey's Eclectic Primer, Report Card, and Kindergarten Diploma. The LFBC Champion Phonics Reader is a phonetic and linguistic reader which may be used to teach reading to children as well as adults. It is also designed to develop phonics-based speed reading. Now included with LFBC Literature I, as it builds on the Beginner's Champion Phonics Reader.